Looking through tourist brochures can sometimes be tempting, because they list umpteen castles and attractions. But look a little closer and you will begin to see the footprints left by a past generation, as if the modern era were lifted off the map leaving a complete picture of life as it used to be, of struggles and economic development, religious patterns and moves, political swings between counts and kings. I recently discovered such a pattern emerging while looking into villages along the Vidourle valley, or the region immediately to the east of Nîmes. Aimargues used to have a strategic position at the crossroads of trade routes, and had a city wall built between 1342 to 1363. This was badly damaged during the wars of religion and then rebuilt, but then the King dismantled it for use in fortifying Aigues Mortes in 1630. Near the village you can visit the Teillan castle, named Villa Telliamis in roman days and dating around 813 AD. It was sold to the Psalmody Abbey, which was based near Aigues Mortes and had a lot of influence in local development. The abbey was given royal permission to collect ancient milestones and roman altars which you are still able to see at the castle. Another historical point is the glacière, which stored ice that wealthy families used for cooling their drinks. This dates from the eighteenth century. Look out too for two washing basins (lavoirs) used to wash clothes in, after the people stopped using the river Vidourle in the nineteenth century. One of them has a restored roof. On the edge of the Camargue region, the village has a Fête de la Petite Camargue on the first Sunday in May, with regional produce and traditions on display and over 5000 visitors. During the rest of the year you can find a general market on Tuesdays, Fridays and Sundays and an antique market on Sundays. Le Cailar stems from the Roman word meaning castle. The castle itself was destroyed in the religious wars by Condé. The village is also proud of its Roman church from the eleventh century. The bull features heavily in local tradition – you can find the tomb of the famous bull ‘Le Sanglier’ at the entrance to the village. The mairie is found in a building established to house the King’s ‘dragons’ during the war of the Camisards. The ‘dragons’ were an elite troop responsible for raiding Protestant homes and seeking out Huguenot preachers, forcing people to convert to Catholicism if they could. The highlight of the year occurs on 23 June when a lit torch is brought down the river Canigou to set alight a bonfire which is the centre of the festival: Les Feux de la Saint Jean. Market day is Friday. Mus is famous for its Roman past, being mentioned in 1165 by records of the abbey of Psalmody, which refer to the underground quarries exploited by the Romans while building the Arena at Nîmes. Roman mosaics have also been discovered nearby. Built by the Emperor Hadrian in 120 AD, the village of Mus was constructed as a stopover place along the Via Domitia on the leg which ran between Nîmes and Spain, which had been conquered by the Roman navy. 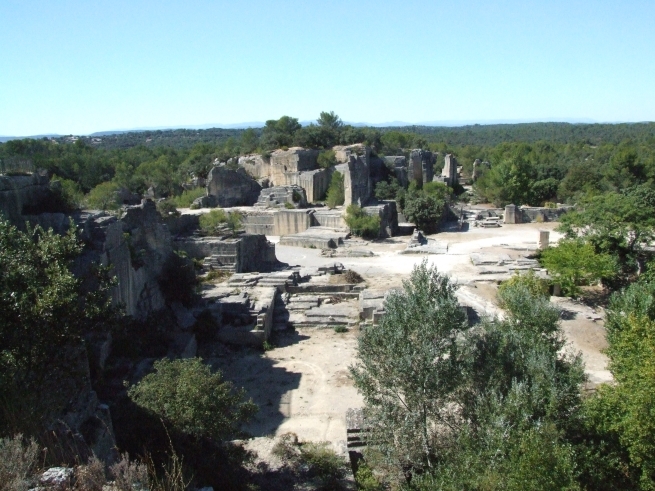 It was situated 8000 Roman steps from Nîmes, or the eighth milestone (borne) from Ambrussum. You can still the milestone at the entrance to the village. Today it is part of the commuter belt for Nîmes and has flourished due to is situation at the crossroads between Spain and Italy, between sea and Cévennes. The traditions of bulls and horses are celebrated here every year, and you can several houses from the eighteenth and nineteenth century, along with a church dating from the seventeenth century. Known for centuries for the quality of its water which was at first used to bathe in and then for drinking supply, Vergèze is the destination for visitors to the source of Perrier water. The village has kept its attractive appearance and is a perfect starting point for discovering Roman and other historic sites in the area – the Oppidum at Nages, the Roc de Gachonne at Calvisson, the Oppidum Ambrussum, the mill at Puech du Rhôny.